I’m pinning my hope on winning the $50 worth of Shutterfly Gift Certificate at the first online contest created by Bambi of Azumi to celebrate her first blogoversary. 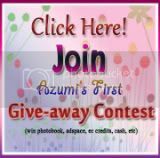 It’s her first mini give-away contest to thank all her readers and followers for the past one year. Click on the button above to get to her site and see the mechanics of the contest. TWO (2) lucky participants will win a $25 Gift Cards to the Shutterfly Store to use for the many print options on the site and additonal prizes from the SPONSORS, and another TWO (2) lucky participants will win the other prizes. Married ka na pala for 13 years noh, that's quite an accomplishment. Am I older than you? 36 na ako eh, mukha ka kasing 20's lang hehehe.. Thanks nga pala for your wonderful comment.. Its true I've gone through a lot of hardships in life but I am glad I did coz I may not be where I am now kung nakuntento lang ako to dun sa barrio namin hehehe.. I added your other site na din sa Nostalgic.. Thanks for adding all of my blogs here.. mwah! Mind if you email me your home add (If).. thanks! No, I'm three years older than you. Matagal ng kuha 'yung profile pic ko Dec. 2007 pa.